Claire Sandberg, who was recently hired to Sen. Bernie Sanders' (I., Vt.) 2020 presidential campaign, said freshman Rep. Ilhan Omar (D., Minn.) was right to call out AIPAC for "shaping" U.S. policy and encouraged Democrats to give monthly donations to her reelection campaign. Sandberg is joining the 2020 campaign as the director of organizing, a senior leadership role tasked with channeling Sanders's grassroots support into a proactive volunteer-initiated network. 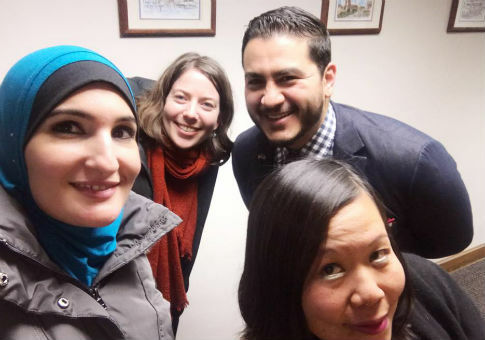 As a progressive organizer, she has been active on Twitter in defending multiple progressive politicians, including Omar, who has faced scrutiny from leaders in both parties for her anti-Semitism. Sandberg, however, has repeatedly defended Omar, specifically her comment about politicians being bought by AIPAC, an organization that advocates pro-Israel policies. A few days after Omar tweeted the anti-Semitic trope, Sandberg said she was "unfairly vilified" and that people should "set up a recurring monthly contribution" to her campaign. "If we think @IlhanMN was unfairly vilified for correctly pointing out the role of money in shaping US policy on Israel, then we should support her not just w/ tweets but also w/ money. I just set up a recurring monthly contribution and I hope you will too," Sandberg tweeted. Sandberg is also friends with Linda Sarsour, a fierce critic of Israel. Sarsour has repeatedly defended Omar's anti-Semitic remarks and has come under scrutiny herself for ties to radical Nation of Islam Minister Louis Farrakhan, who compared Jews to termites last year. Sanderg was one of several core staff members who stepped down in August 2016 from Our Revolution, a political nonprofit that spun off of Sanders's 2016 presidential campaign. She and others were concerned that Jeff Weaver, who was tapped to lead the organization, would waste money on television advertising and would be "plowing that billionaire cash into TV instead of investing it in building a genuine movement." "It's no secret that I had my disagreements with Jeff in the past, but a little less than four years later, I look back on the first campaign and I can think of many more things that he did right then that he did wrong," Sandberg told CNN in an interview. "I think it says a lot about who he is and his commitment to Bernie and to our movement that he was willing to accept my apology and ask me to return despite the history there." This entry was posted in Politics and tagged 2020 Election, Anti-Semitism, Bernie Sanders, Ilhan Omar, Israel, Linda Sarsour, Louis Farrakhan. Bookmark the permalink.